The diagram to the right shows a single stage MOSFET tuned mixer. Depending on the frequency of operation, the gain will be from 10dB to 20dB - higher gain at lower frequencies. AGC should not be applied to this type of circuit. 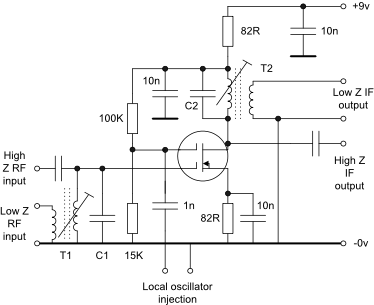 Oscillator injection should be 4v peak-peak.